Toenail fungus and fingernail fungus is a serious health issue. Onychomycosis, or nail fungus, is a fungal infection of the nail bed. Onychomycosis attacks fingernails as well as toenails. Nail fungus is seen first as a yellowing or darkening of your nails which then leads to a thickening and crumbling of the nail. You arer not alone is you have nail fungus, research shows that between six and ten percent of the population have nail fungus infections. Fungus infected nails can lead not only to serious damage to the toenail and nail bed but can also result in loss of the toenail. Toenail fungus also causes your feet to give off an offensive odor. If left untreated, nail fungus will not go away. Now, thanks to laser treatment there’s a better solution for toenail and fingernail fungal infections. Why Laser Toenail Fungus treatment for fungus Removal? Painless laser light works into the nail and nail bed – surgical removal is not necessary. How does the CoolTouch Laser Work? The CoolTouch CT3Plus CoolBreeze produces laser light energy that is specifically absorbed by water and water associated with collagen, a major component of nail growth as well as skin. This sophisticated laser can detect and reach the proper target temperature, killing the fungus. The treatment then stops immediately, and the nail is cooled with a cryogen spray. The CoolTouch CT3 plus zoom is an industry-leading laser that was developed for skin treatment. This is a perfect fit for fungal nails since the nail is simply modified skin. How Do I Prepare for My Visit? First use a sturdy nail clipper to cut the nails as short as possible. Grinding of thickened nails might be necessary. Use a nail file to remove excess thickness so that the laser can more easily penetrate through the nail into the nail bed and kill the fungus. Remove all polish, lotions and scrub feet and toes, making certain that the skin of the foot and nail bed are completely clean and dry. Compare laser toenail fungus removal to Jublia, a new topical product recently available on the market. Jublia had effectiveness in 15 to 18 percent of trial users after 48 weeks of usage, at an estimated cost of $8,624. Laser removal, conversely, costs mere hundreds of dollars, is effective in killing the fungus, and requires little time. Clear Nails Pro+, one of New Radiance’s best products, doctor recommended triple anti-fungal topicals used for the prevention of spreading or worsening onychomycosis. CNP is a naturally occurring, non-toxic, organic compound that carries the fungicidal essential oils all the way to the nail bed. The new formulation of Clear Nails Pro+ contains a single, unique broad spectrum active ingredient called PHMB 0.5% (Polyhexamethylene Biguanide) that has improved ability to penetrate the nail plate. This is a toxicity free antimicrobial with no known resistance to any bacterial, fungal or yeast strain. Always wear clean socks or stockings. Wear comfortable shoes and hosiery that allow your feet some breathing space. Wear shoes, sandals or flip-flops in community showers or locker rooms. Wash your feet every day, scrubbing your nails with disinfecting soap, drying them thoroughly. If using nail polish, we recommend anti-fungal nail polish. Decided that laser nail fungus treatment is for you? 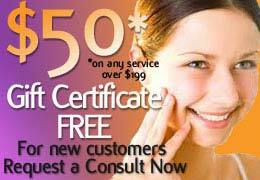 Contact us today to schedule your complimentary consultation at New Radiance! * To ease and elevate bruising a possible side affect of these treatments, We ask that you stop taking Aspirin, Garlic supplements, Fish Oil, Vitamin E, and any and all blood thinners within 48 hours of your appointment.